For my first 32 years, I heard all the sounds of life, including my two sons’ first cries. But Christmas 1988 was the last time I heard normally. That winter, I suffered a major sinus infection which left me with mild hearing loss in the right ear. I got a hearing aid and things started sounding better; doctors assured me it wouldn’t get worse, but over the next 16 years, that proved to be quite untrue. When my left ear starting fading also, I had numerous MRIs, but doctors could not figure it out. I vividly remember staying up all night with my husband, Randy, both of us crying. What was wrong with me? Why was I losing my hearing? We were both terrified I would wake up one morning completely deaf. Even with the addition of a second hearing aid, it was getting dangerous for me to be in parking lots; I couldn’t hear cars speeding up behind me. I was terrified of being home alone when Randy traveled for work. My corgi adapted to my loss and helpfully barked to alert me to the phone or oven timer, but I was isolating myself socially. It was difficult to be involved in conversations with friends, and my adolescent sons were struggling to communicate with me, too. Frightened and frustrated, they lost patience when I was unable to understand. In the spring of 2005, at my (dreaded) yearly hearing test, the audiologist asked, “How are you functioning?” In tears, knowing I had ‘failed’ once again, I responded that I was not. I was actually totally withdrawn from life. She said I might qualify for a cochlear implant (CI), and I cried even more at the hope of a solution. There were very few surgeons near our New Orleans home at the time who were doing CI surgery, but I was referred to one and confirmed as a candidate. On August 27, 2005, I got approval in the mail from my insurance company. The very next day, Hurricane Katrina wreaked havoc on New Orleans and forced us to evacuate our home. I had that insurance letter in my hand on the way out the door! My son Caleb’s wedding was scheduled to take place in New Orleans for the week after we evacuated, but luckily we relocated. Though it was a beautiful day, I could not hear the vows or the toasts. All the noise was muffled by my hearing aids. The same thing happened at my son Josh’s graduation. He was valedictorian, but even from the front row, I didn’t hear his speech. My surgery could not come soon enough; I had zero reservations about it. My CI was scheduled for six weeks after Hurricane Katrina, and the hospital regained power just in time. They shaved the right half of my head and made an incision all the way behind my ear. Then, I waited six weeks for activation, anxious, nervous and excited. It seemed like forever. My hearing aid in my left ear wasn’t doing much and I depended on reading lips. Curiosity consumed me — what would it sound like? The first things I heard were beeps and buzzes. They were testing the electrodes to make sure everything was connecting and firing up. The next thing I knew, I heard Randy say he loved me, and we were both crying. He was the first one I wanted to hear. One week after activation day was Thanksgiving, my first real holiday in a long time. The whole family gathered, and unlike years before, I was part of every conversation. Voices sounded crisp and clear, and I learned that my sons had developed a habit of talking about me behind my back, even when I was in the room! In those first few weeks, I relearned sounds. Even the sounds of the car blinker and the hum of the refrigerator were new. Some sounds were wonderful: waterfalls, birds chirping and waves crashing on the beach. I am forever grateful for finding the Cochlear Implant Center at GBMC. They took the time to know me as a person and understand my life and family. I’m not just a number here, like at other places. Dr. Presley goes above and beyond, even holding workshops for patients where we care for each other and learn together. Her passion for helping is amazing. She now helps me extend my wonderful experience with the Cochlear Implant Center into volunteerism by connecting me with new CI candidates. I answer questions from a patient perspective and offer support. It’s so much more than just a clinical setting here — it’s family. For additional information on the services provided by GBMC’s Cochlear Implant Center, visit www.gbmc.org/cochlear or call 443-849-GBMC (4262). Read Adele’s family’s perspective of her hearing loss at www.gbmc.org/cochlearpatienttestimonials. If you or a loved one is in need of home healthcare, call the Support Our Elders Program at 443-849-6257 or visit their website at www.gilchristservices.org/soe for the full list of eligibility criteria and program benefits. To see a video with more of Estelle Langstrom’s story and to learn more about the program, visit http://bit.ly/1R7pORw. In a large soup pot, heat oil over medium heat. Add carrots, celery, and onions; cook and stir until the onion is tender. Stir in garlic, oregano, basil, and pepper. Cook for 2 minutes. Stir in lentils and tomatoes, then add the vegetable broth and water. Cover and bring to a boil. 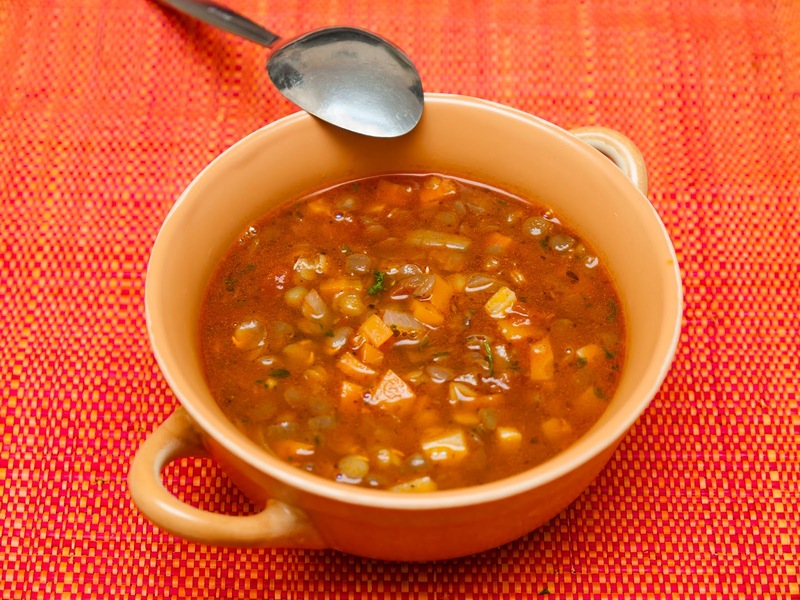 Reduce heat and simmer for at least 1 hour or until lentils are tender. Store leftovers in the refrigerator and reheat on the stove or in the microwave. The soup will taste better the next day! 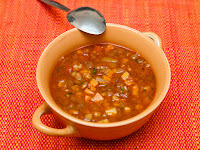 Recipe retrieved from http://www.nhlbi.nih.gov/health/educational/wecan/eat-right/lentil-soup.htm provided by the U.S. Department of Health and Human Services.